I think I'm going to need to see this one again sometime in the near future, perhaps by introducing it to some friends who I think may be receptive to what the film has to offer. -- The zoo setting and the stylization of the locations therein were wonderfully realized, almost like a series of walkthrough installation pieces committed to film. I'm not sure if it's just a function of the architecture or the lighting, but at times I experienced confusion about whether certain spaces were in fact indoors or outdoors. Before its true purpose was revealed, I laughed off the flashing lights in the time-lapse photography lab as sort of a music-videoesque affectation, but once I knew what Oswald/Oliver were doing in there it became an indelible nightmare image. The same for the titular Z-O-O sign and the various bits of business going on around it with the billboard and accident scene, which had this weirdly compressed quality like how a stage set would depict a city block. Nothing seemed quite real, even the stuff that I knew had to be shot in a real location somewhere in the world. -- I know that I've seen films with Michael Nyman's scoring previously, but I don't really recall the music in them per se. That issue did not exist here: I don't have the musical vocabulary to really identify what he was doing here, but the three or four repeated motifs in this film (especially the time-lapse cutaways to the increasingly-complex decaying animals) were no less effective for the insane number of times they came back up on the soundtrack. -- Going back to the zoo setting, I can't help but wonder if that was any sort of influence on the first series of The Mighty Boosh, in terms of showing an unseemly, fly-by-night underbelly to a place that is ostensibly operating according to certain principles of science and reason and social responsibility. The same goes for certain of the characters, although that may just be the long-standing affection that 20th century British art and comedy have for the offputting/grotesque. A Zed and Two Noughts is one of those films that I don't think I have anything to add about. I know it very well, or at least did. 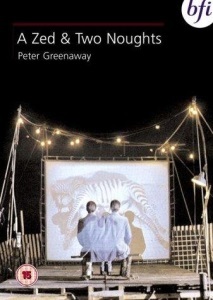 It came out during one of the oddest and most mentally damaging years of my life, which I responded to by becoming obsessed with Peter Greenaway's films (although there was only this, The Draughtsman's Contract and the collection of at that time hard to see shorts and experimental films that I usually refer to as "The Early, Funny Ones". No one else does that, only me). So, it sort of slotted into my psychology and I don't really have any critical distance from it. The park keeper is played by the widely reviled stand-up comedian Jim Davidson, I know that much. Probably the only film that features both him and David Attenborough. I appear to have it on DVD. I should watch it again.